Axiomtek announces GOT3126T-832, its new wide-temperature 12.1in fanless touch panel computer, supports the newest Intel Atomprocessor N2600 dual core 1.6GHz with the Intel NM10 chipset. 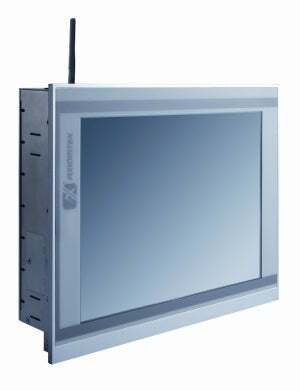 It is equipped with 12.1in SVGA colour TFT LCD display with high brightness 500nits and LED backlight. With incredible low-power and rugged design, the GOT3126T-832 works smooth between -20°C to +55°C. The fanless design also makes this all-in-one panel computer more reliable and stable, without dust or noise issues. The GOT3126T-832 is an excellent human-machine interface platform for applications in transportation, oil pipe monitoring systems, and environmental monitoring. "Our new GOT3126T-832 adopts the ultra low-power Cedarview processor and a fanless design. This rugged unit is made with aluminum housing and has IP65/NEMA 4 protection to prevent the system from outside damage," said Virgil Hsu, product manager of product marketing division at Axiomtek. "It also features slim ID and less screws design on back chassis that bring easy maintenance. Moreover, it can withstand operating temperature from -20 to +55°C that can be applied to outdoor environment. "Furthermore, the GOT3126T-832 is compatible with Windows7 Embedded Standard and Windows7 (32-bit), which allows developers to quickly and easily bring devices to market." The GOT3126T-832 has a compact ID for space-limited environment with a thickness of 56.9mm and weight of 2.8kg, allowing easy installation anywhere. It adopts the lightweight aluminum material that can dissipate heat easily and keep the system operation stably. Considering to the popular network environment, the GOT3126T-832 has a PCI Express Mini Card slot and a fixed rotational WLAN antenna (optional) for wireless network connection. By just plugging in the WLAN Mini Card, users can have instant access to wireless LAN/GPRS/GSM/3G easily. This durable panel computer offers excellent vibration resistance up to 1.3Grms (with 2.5in HDD) for stable and extreme reliable operations. The GOT3126T-832 supports one DDR3 SO-DIMM slot with up to 2GB memory and features one 2.5in SATA HDD and CompactFlash socket. Rich I/O connections include three COM (2 RS-232 & 1 RS-232/422/485), four USB 2.0, two Gigabit Ethernet, audio (line-out), and VGA. This unit comes equipped with various mounting selections: panel mount, wall mount, VESA arm and desktop stand. Furthermore, it features a built-in fuse to minimize circuit damage from over current. The low-power, fanless GOT3126T-832 will be available around late of June 2013. For more product information or pricing, please visit us on our website.